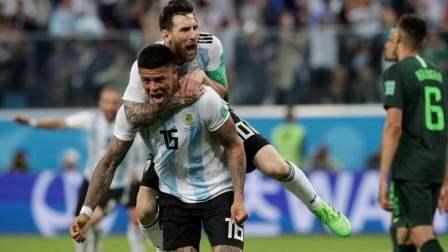 Marcus Rojo's stunning finish four minutes from time kept Lionel Messi and Argentina's World Cup hopes alive to see off Nigeria 2-1 on Tuesday and set up a last 16 meeting with France. Messi's first goal of the tournament got the two-time winners off to a perfect start in Saint Petersburg, but Victor Moses's 51st minute penalty had Jorge Sampaoli's men headed for a humiliating group stage exit until Rojo's late intervention. Higuain just couldn't flick the ball beyond the onrushing Francis Uzoho from a defence splitting pass before Uzoho then tipped a Messi free-kick onto the post. Messi produced a magical performance in Argentina's final qualifier with a hat trick in Ecuador just to get his country to Russia. Croatia wrapped up top spot in Group D in Rostov-on-Don thanks to a slick second-half volley by Milan Badelj and a late strike by Ivan Perisic, sandwiching a penalty equaliser by Gylfi Sigurdsson.